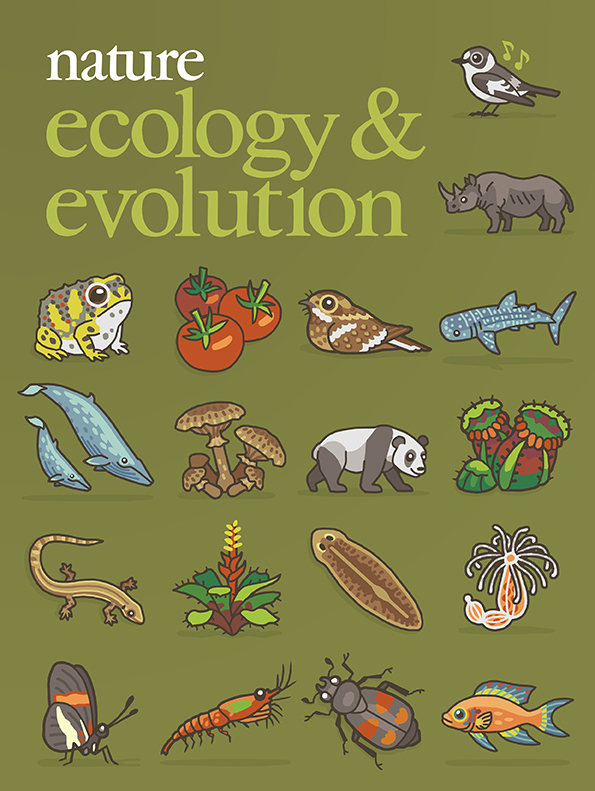 This month's cover is by Rosemary Mosco and it celebrates some of the species that have appeared in the pages of Nature Ecology & Evolution during the journal's first year. Collared flycatcher, Ficedula albicollis, from 0039, 0060 and 0192. Black rhinoceros, Diceros bicornis, from 0088. Crucifix toad, Notaden bennetti, from 0268-6. Tomato, Solanum lycopersicum, from 0231-6. Mozambique nightjar, Caprimulgus fossii, from 0256-x. Whale shark, Rhincodon typus, from 0004. Blue whale, Balaenoptera musculus, from 0188 and 0336-y. The plant pathogenic fungus Armillaria ostoyae from 0347-8. Giant panda, Ailuropoda melanoleuca, from 0317-1. Pitcher plant, Cephalotus follicularis, from 0059. Common lizard, Zootoca vivipara, from 0161. The bromeliad Aechmea nudicaulis from 0015 and 0032. The platyhelminth Schmidtea mediterranea from 0019. Starlet sea anenome, Nematostella vectensis, from 0285-5. Red postman, Heliconius erato, from 0052. Antarctic krill, Euphausia superba, from 0177 and 0368-3. The burying beetle Nicrophorus vespilloides from 0178. Daffodil cichlid, Neolamprologus pulcher, from 0137.